Pre-requisite: A minimum of two Wheel I classes & at least one Wheel 1.5 class. Materials and firing fees are in addition to tuition. If your class is scheduled to occur in the evenings after 5PM or if you arrive on a weekend before 10AM, please enter the facilities through our rear, handicap-accessible Studio Entrance across from the Parking Lot. The front entrance and offices lock at 5PM. As you enter through the Studio Entrance, please take a right if you are looking for the Ceramics Studio. Please take a left if you are looking for the Metals Studio or the Multimedia Studio. 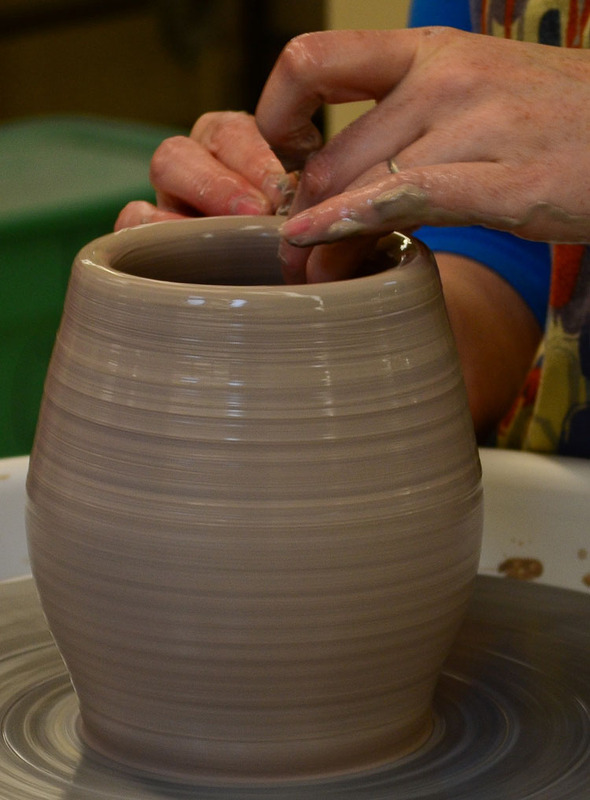 Express your creativity using the potter's wheel and learn to make better pots. Develop your own ideas and improve your skills and artisanship for form, decoration, and finishing of functional pottery. From mugs to dinnerware and jars, forming and glazing: faculty provides the inspiration and feedback you need to make the pots you want to make. This class is best suited for intermediate to advanced level wheel-throwers who have taken who have taken a minimum of two Wheel I classes and at least one Wheel 1.5 class within the last year and a half.